I assume you mean the sauna cave as there are hundreds of caves around this canyon. The Sauna cave is on the Colorado river you know and you can not get there unless the river is low. Or you are an excellent swimmer. You do know the river is @ 50 degrees year round too. Or you can get there by boat. The Sauna cave goes into the hill 60 ft. and has hot water coming from the back of it. It was dug by the dam builders for the river diversion. So they could build the dam and divert the river around the damsite. But, they abandoned the site and moved further up stream because of the hot springs there. An excellent place for relaxing. Except it gets crowded some times. When I was there last week end I could not find any trash to take out. Or you could mean The lower cave pool which actually has 2 caves if you look for them. 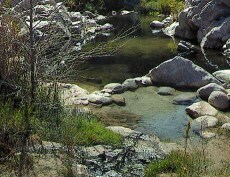 Last week end the upper cave pool was almost full from the extra rain but only @ 100 degrees. I went in the cave just because I missed it. The hot water coming from the source there is still slow.